After a false start last year, Apple have finally announced the new Apple iPhone 5. 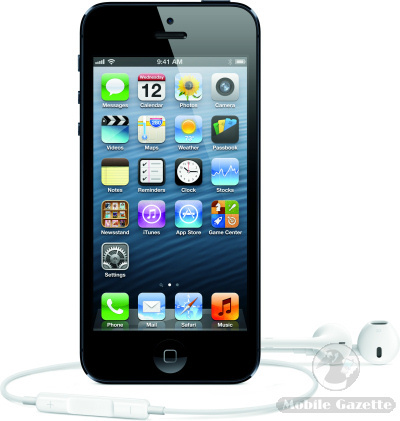 Featuring a bigger screen, faster processor and several other improvements, the iPhone 5 represents an evolutionary upgrade to the iPhone 4S rather being a revolutionary new device. One immediately noticeable thing is the larger screen, which is now a 4" 1136 x 640 pixel panel, rather than the 3.5" 960 x 640 pixel panel of the 4S. Compared to the competition, the old display was tiny, but the new display is still substantially smaller than other high-end smartphones. Apple say that the display now has 44% more colour saturation, making images more vivid. It is also a thinner display panel than before which is one reason why the iPhone 5 is 18% thinner than the 4S. The operating system has been updated to iOS 6, and the pre-installed applications make full use of the larger screen, the home screen now sports 5 rows of icons as well. Third party applications may need to be re-engineered for best results, but the iPhone 5 can run legacy applications in a "letterbox" format which will aid compatibility. iOS6 will also be available for other compatible iPhones (the 3GS, 4, 4S, iPad 2 and iPad 3) after September 19th. There are several other changes to the iPhone's software. A new mapping application in partnership with TomTom replaces Google Maps (and the iPhone 5 now supports GLONASS as well as GPS positioning), Siri has been improved and you can now post Facebook updates with it (which raises the possibility of some embarrassing accidents!) and iTunes is simpler to use and features more integration with social networking services. On the back is an 8 megapixel camera with an LED flash capable of 1080p HD video capture, and the front-facing camera has been upgraded to produce 720p video. Apple say that the primary camera is 40% faster than in the 4S and has several other improvements too. Incidentally, Facetime video calls can now work over cellular networks as well as WiFi, although the competition was doing that a decade ago. Inside, the new Apple A6 processor is twice as fast as the one in the iPhone 4S, and graphics performance has also been doubled. One of the games showcased for the iPhone 5 is the incredibly detailed Real Racing 3, but a faster processor will also help with multimedia playback and even general web browsing. 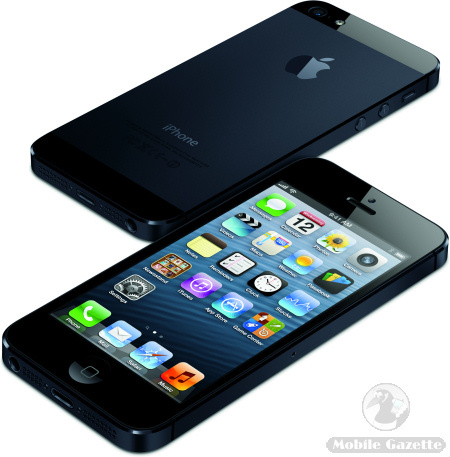 The Apple iPhone 5 now supports 4G LTE as well as DC-HSDPA and HSPA+ high-speed networks. Of course it also supports 3G and 2G networks as well plus WiFi downloads of up to 150Mbps and Bluetooth connectivity. EVDO and CDMA will also be supported for the US Verizon Wireless version. Apple say that the iPhone 5 can automatically switch between antennas to get the best signal possible. Physically, the Apple iPhone 5's casing is made entirely of precisely engineered glass and aluminium and is just 7.6mm thick and weighs only 112 grams, which is 18% thinner and 20% lighter than the 4S despite having a much bigger display. There is a new type of "Lightning" connector on the bottom, although adapters will be available for compatibility purposes. Available colours are "Black & Slate" and "White & Silver", so both devices have a two tone effect that makes them more interesting to look at than the fairly plain slabby iPhone 4S design. We don't know how big the battery is, but Apple say that it is good for 8 hours talk time, 225 hours standby, 10 hours WiFi browsing and 8 hours browsing on LTE. In the US it will cost $199 for the 16GB version, $299 for the 32GB version and $399 for the 64GB version when taken with a two year contract, which is the same price as the iPhone 4S was so you can expect international versions to be a similar price. 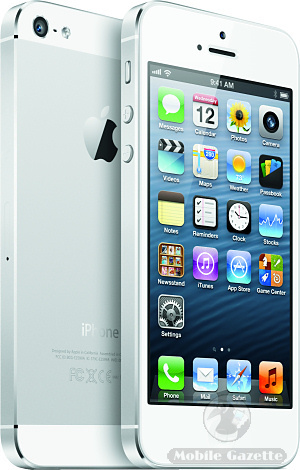 The iPhone 4S is now just $99 in the US with a new contract, and the original iPhone 4 will be free. Pre-orders start on Friday 14th September and (lawyers permitting) the iPhone 5 will start shipping on 21st September in the US, Canada, UK, Germany, France, Japan, Hong Kong, Singapore and Australia with other countries following shortly afterwards. Overall, the Apple iPhone 5 is quite impressive but it doesn't have any surprises. Crucially, the 4" display is nowhere near as big as rivals but Apple were restricted in what they could do if they didn't want to make the new iPhone wider. There appears to be no NFC support, and some higher-end rivals now offer wireless charging too. However, the rival Nokia Lumia 920 which does offer all these things weighs a massive 65% more than the lightweight and very slim iPhone 5. Clearly, the iPhone 5 will be a huge sales success, even though it is hardly a radical phone by today's standards. Perhaps Apple will come up with something truly revolutionary with the iPhone 6? We'll have to wait and see.